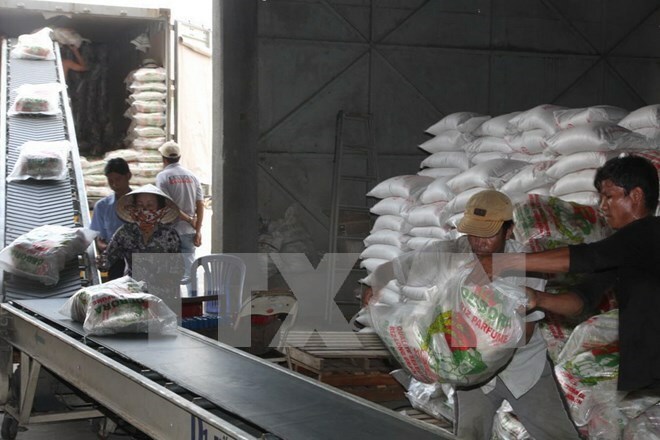 Hanoi (VNA) – Vietnam’s rice exports are likely to reach 6.8 million tonnes in 2015, according to the Ministry of Agriculture and Rural Development’s Centre for Informatics and Statistics. The figure was revised from the centre’s previous 6.02 million tonne forecast. Vietnam saw continual year-on-year deceases in rice exports during the first 10 months of 2015 and has just recorded a rise in November. The rebound is attributable to the country’s signing of rice export contracts with the Philippines (450,000 tonnes) and Indonesia (1 million tonnes) in October. The contracts, valid from October 2015 to March 2016, helped the rice export volume in October and November almost double that of the previous months. Vietnam shipped abroad 6.24million tonnes of rice worth 2.65 billion USD in the 11 months of 2015, up 3.6 percent in volume and down 4.9 percent in value from the same period last year. Between January and October, China was still the biggest rice buyer of Vietnam, accounting for 34.49 percent of the total exported. The rice volume destined for Malaysia climbed 2.24 percent to account for 8.7 percent of the exported, making the country Vietnam’s third largest rice importer. Ghana ranked fourth with a hike of some 9 percent in Vietnamese rice imports, followed by Ivory Coast (up 39 percent) and Indonesia (up 3.65 percent).